Last night we enjoyed a small roast for dinner, just the two of us, facing a succulent three-pound loin of pork. Slow cooked at low temp, spice rubbed, sliced thin and served with warmed chipotle raspberry sauce; OMG it was tasty. But today almost all of that roast remains, plastic-wrapped in the fridge, awaiting its next appearance. What was I thinking, making a roast for only two diners? And now what do I do with all that pork? Chopping and assembling don’t count as real cooking. There’s no recipe and you hardly need to concentrate, both good things since I spent a lot of time gazing out the galley windows while prepping. Skiffs putted by, diving birds popped up and down, the occasional eagle and heron swooped by above the treetops, and even the cloud formations were dynamic. Meyers Chuck was a happening place today. Here’s the recipe, such as it is, and a two-thumbs up rating for no-fuss, easy solution #1 to the Too Much Pork Problem. Unfortunately there’s still enough meat left for solutions #2 to 5, whatever they are, sometime in the future. So, “divide, freeze, wait for inspiration” is my next best choice. 1. Cut the vegetables, but watch your fingers if you’re gazing out your galley window at the same time. 2. Mix the vinegar, oil, Ponzu and fish sauce in a small bowl. Add the slivers of pork, onions, jalapeno bits and the sesame seeds. Toss to mix, and set aside to marinate briefly. 3. Heat 3 cups of water to boiling and remove from the stovetop or micro. Drop the rice noodles into the water and let sit until softened, about 3 minutes or so. Use a spider or strainer to remove the limp noodles, but keep the hot water to soak the rice paper wrappers. Rinse the noodles with cold water and drain again. 4. Fill a pie plate or other flat pan with hot water, about an inch deep. Submerge one rice paper wrapper and let it sit until soft and pliable, about 10 seconds - don’t oversoak or it turns mushy and tears easily. Remove the wrapper and lay flat on a plate or cutting board. If a wrapper does tear, just layer another soaked wrapper on top and carry on. 5. Place a small portion of pork in a line across the bottom third of the wrapper. Scatter a pinch of carrot over it. Scatter a pinch of cuke over that. Do the same with the radish slices and basil or mint shreds. Add some noodles to the pile. Resist the temptation to overfill and use too much noodle. 6. Fold the bottom of the wrapper over the filling and, pressing firmly, roll into a tight cylinder. Press firmly as you go, rolling as tight as you can without tearing the wrapper. If you use the larger size of spring roll wrapper you can fold in the sides as you go, like rolling a burrito. 7. Repeat with the remaining wrappers and fillings. Notes: The spring rolls will hold for an hour or two, covered lightly with plastic wrap or a damp towel, but will get very soggy if referigerated or held much longer. Why not roll and eat right away? A large platter of fillings and wraps can also be a fun Build Your Own station when friends gather, though experience shows that women play with food and guys wait for someone to fix theirs. Dice any unused vegetables above. Rough chop a handful of peanuts. In a bowl add the vegetable bits, peanuts, leftover noodles and meat. Toss with a splash of seasoned rice vinegar, sesame oil and Ponzu. Add extra portions of vegies, meat or seasonings as desired. It’s just as good as the Spring Rolls without the rolling exercise! Was Spring slow to arrive this year? Did it arrive and stay with us for more than a few hours? Did I miss it while we were inside the boat shed in May? I'm still waiting for Spring warmth and sunshine to last for more than two days in a row. Too bad! summer officially begins next week, so it's time to move on. Spring means green - new shoots on plants, buds on trees, weeds in the flowerbeds, and fresh greens at the market. We've been enjoying a lot of green produce lately, transitioning from winter's offering of dark green kale to the brighter tones of asparagus for example. But this post is also about chicken, not just about Spring. I am wild about roast chicken, whether homemade or deli-purchased. It's crispy, decadent bits of skin are swoon-worthy, the flavorful dark meat or even slices of moist breast meat are mouthwateringly good. However, the good news/bad news about chicken is that each small bird provides more than one meal's worth of protein. This week's roast chicken left me with a lot of leftover meat. Usually that means chicken enchiladas, but I just wasn't in the mood for more Mexican food (shock!). 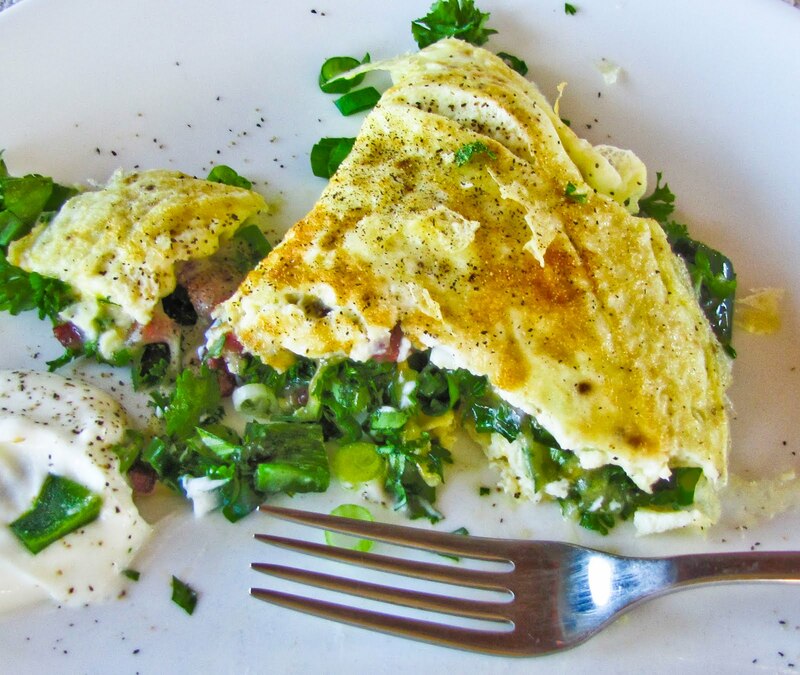 First we shared a brunch omelet filled with shredded chicken, parsley, asparagus and sauteed kale left from dinner, crumbled bacon and green onions, accompanied with a side sauce based on yogurt and chopped herbs. RL does not love eggs, but he certainly put away his half of this omelet. 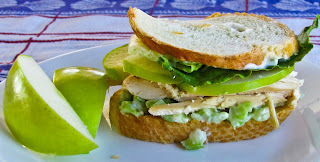 Another day's lunch featured sandwiches on grilled French bread, spread with a mix of cream cheese, creamy blue cheese, green onions, parsley, crumbled bacon and pecans and filled with sliced chicken, thinly sliced Granny Smith apples and Romaine lettuce. Oh yes, I'm adding this combination to our list of favorites. 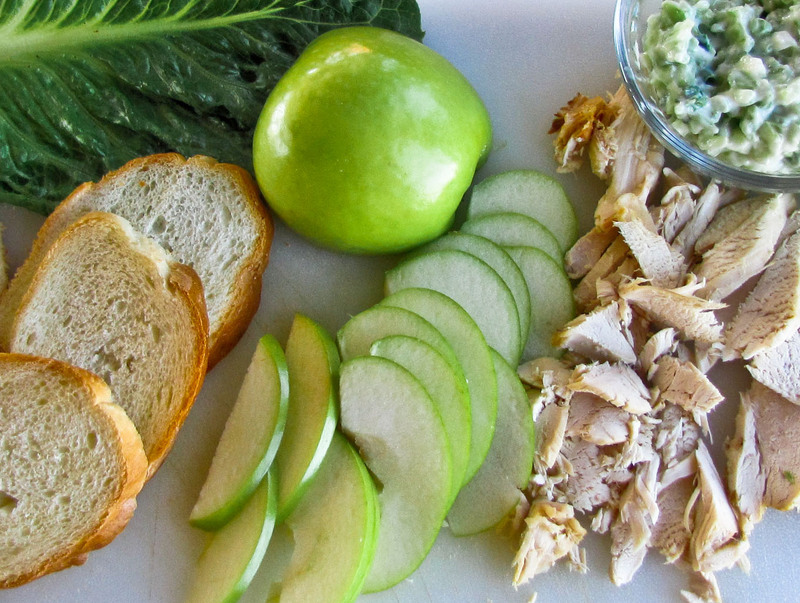 Even the unassembled ingredients look tasty. There was still some chicken meat to deal with. Rather than freeze it for another day, it seemed reasonable to try a new (to us) version of chicken salad. 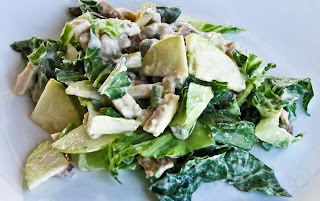 More of the same ingredients - chicken, Romaine, apples, parsley, green onions, pecans - and this time with a thin-but-creamy Miracle Whip dressing with a few tablespoons of Major Grey chutney mixed in for a sweet and tangy flavor. (Yes, Miracle Whip! and the only way I ever use it, except on RL's sandwiches.) Hooray, another winner with chicken and green things. Enough with the chicken already! Not that I won't turn to chicken enchiladas as an easy follow-on to the next roast chicken dinner, but this week's wander into Spring Green Something territory was a good thing. What do you do with too much chicken? I bake a lot when we are on board, items for us to enjoy, to share with friends, or to exchange with fishermen. I have traded cookies for crab, sticky buns for halibut, French bread baguettes for salmon, and sourdough boules for prawns. Lately, even while up on the hard, I've been baking cookies and bread and the galley smells terrific. Cookies are immediate, and the boatyard crew seems to enjoy them, but even with its two-day wait I think we relish the sourdough more. It's become a Rhapsody tradition, and the sight of the red bread pot puts a smile on the captain's face. Over the past few years I have seen SO many blogs, books, articles and YouTube videos that rave on about No Knead Bread, that I don’t remember which riff off the original Jim Lahey recipe came from where. I just know that we love this loaf - it’s tang, its crunchy crust, it’s chewy texture. We eat it as a snack, use it for sandwiches, toast it for breakfast, and prefer it to all other croutons or bruschetta bases. It makes an interesting savory French toast too. We enjoy sourdough with the addition of fresh rosemary and walnut halves. Feta cheese and whole, pitted Kalamata olives are pretty tasty too. But the dough really doesn’t need any additives, it’s all about the textures and that sourdough tang. My starter is pretty thick, and the following quantities create a loose, shaggy dough that isn’t too stiff. 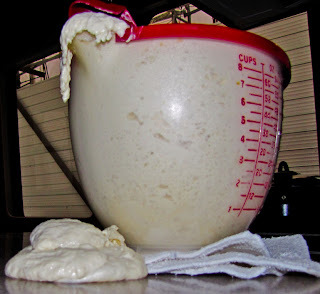 With a looser starter, I’d decrease the water and/or increase the flour. Experiment, get a feel for it - sourdough is really forgiving. 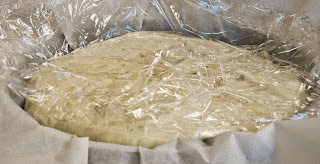 It even holds well in the refrigerator after mixing, before the second rise, and may develop a deeper sourdough flavor. I begin with a heaping cup of well-fed starter, pulled from a jar that has been standing at room temperature for a couple of hours. Add 1 ¼ cup of warm water and whisk it in. Add 1 tsp salt and whisk some more. Then, a cup at a time, whisk in a scant 3 cups of AP flour, mixing well after each addition and switching to a wooden spoon when it gets thicker. Towards the end when the mix gets really stiff, use a dough scraper to work in the dry flour at the bottom of the bowl, folding and mixing until a very shaggy ball forms. And then fold and work it some more, resisting the urge to grab that sticky stuff and knead it like crazy. I suppose you could knead it, but you just don’t need to. 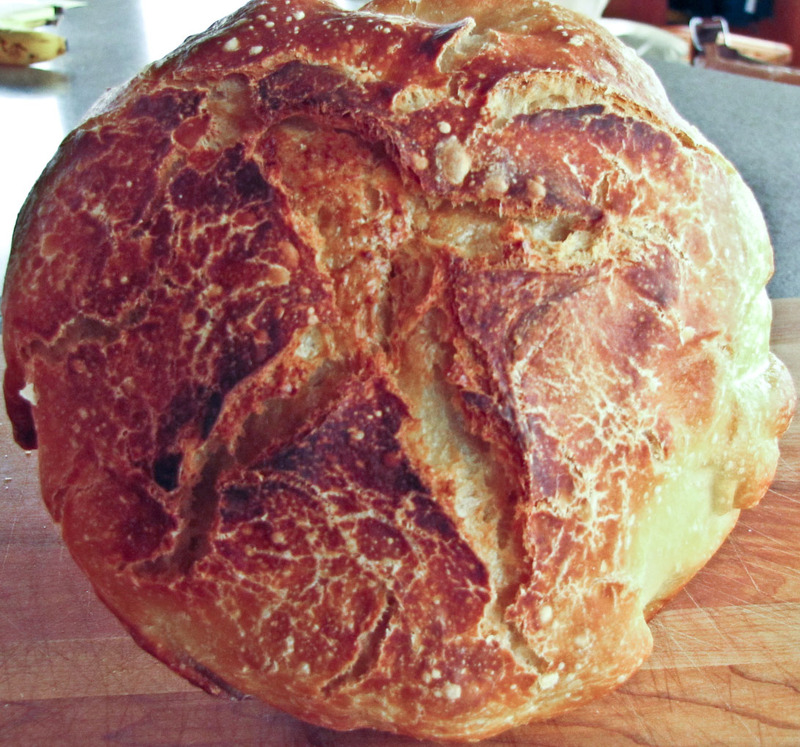 It’s No Knead Bread. Cover the bowl with plastic wrap and let it sit overnight at room temperature for 12 hours or more. Be sure to give it a lot of space to expand since it can get pretty frisky. Shape the dough into a ball, pulling the edges into the middle over and over, and place it on parchment paper in a skillet that’s roughly the diameter of your Dutch oven. The paper will flop over the sides, and that’s a good thing. Spray the dough lightly with cooking spray and cover with plastic wrap. Let it sit at room temperature until it rises, roughly doubling in size (anywhere from 2 to 6 hours depending on room temperature) and it doesn’t spring back when poked with a finger. At least 30 minutes before baking, adjust oven rack to the next-to-lowest position, place a 6-to8 quart heavy-bottomed Dutch oven (and its lid) on the rack, and heat the oven to 475 F degrees. 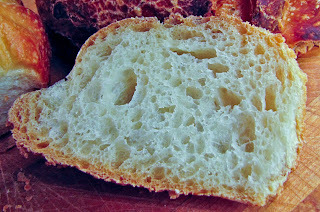 Lightly flour the top of the dough and use a sharp knife to make a ½-inch deep slit or two along the top of the dough. Carefully remove the pot and lid from the oven. Pick up the dough by lifting the parchment overhang and lower into the pot, letting any excess parchment hang over the pot edge. Cover the pot and place in the oven. Bake covered for 30 minutes. 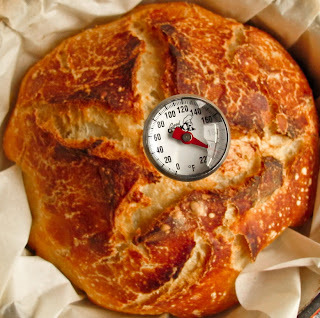 Remove the lid, reduce the oven temperature to 425 degrees, and continue to bake the loaf until it is deep brown in color, about 20 to 30 minutes longer. A quik-read thermometer should register between 200 and 210 F.
Carefully remove the bread from the pot, transfer to a wire rack and cool to room temperature, about 2 hours… or until you can’t wait any longer to sample the first chunk. Oh my, it's especially good slathered with butter and sprinkled lightly with sea salt. I think I might be a breadaholic.